Earn $34.25 in Rewards credit (3425 points) What's This? Cannondale's 2019 Althea 3 Women's Hybrid Bike features a lightweight SmartForm C2 alloy frame and an upright yet balanced riding position that's perfectly suited to multi-surface riding and commuting. Frame: SmartForm C2 Alloy, SAVE, 1-1/2" to 1-1/8" tapered head tube. Fork: SR Suntour NEX w/ lockout, 50mm (S, M) / SR Suntour M3030, Lockout, 63mm (XS) / 1-1/8" steerer. Headset: VP Si 1-1/2"- 1-1/8". Shifters: Shimano M310 Rapidfire Plus, 3x8. Crankset: SR Suntour XCE, 48/38/28. Brakeset: Tektro M285 hydro disc, 160/160mm. Handlebar: Cannondale C4, 6061 double-butted, 12mm rise, 660mm. Stem: Cannondale C3, 6061 Alloy, 31.8, 12°. Saddle: Cannondale Women's CX Ergo. 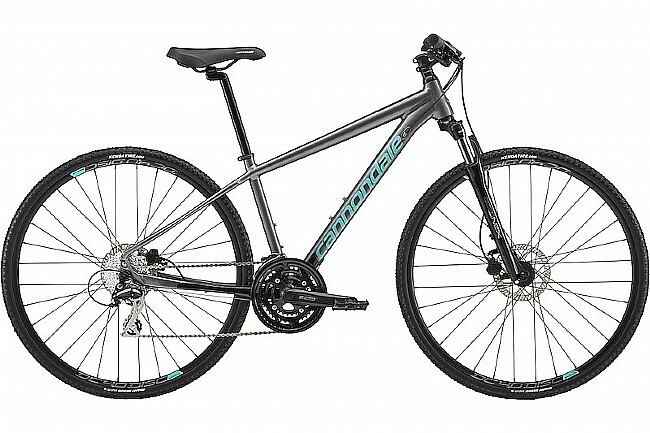 Pedals: Cannondale Fitness Reinforced Composite. Rims: DC 3.0, double wall w/eyelet, 32h. Hubs: Alloy Disc, sealed, loose ball bearings, QR, 32h. Tires: Kenda Happy Medium, 700 x 35c (S, M) / Schwalbe G-One, 650 x 38c (XS only). Manufacturer Warranty: Limited lifetime for frame; limited 1-year for components.